Login as an admin and click on Notifications. Click on Upgrade button at the bottom of the page. Moodle will setup the tables required for Crot Pro. 3.1 Go to Advanced Features in the Admin's menu and check "Enable plagiarism plugins" option. Save changes. 3.2 Open Plugins/Plagiarism prevention/Crotpro link from the Admin's menu. 3.3 Check "Enable Crot Pro"
Account ID: your account id. If you do not have one you may get free account id by clicking on the link next to the account id attribute. 5.1. Login as a teacher to Moodle. 5.3. Click Assignment administration/Edit settings link. 5.4. In the Crot Pro block enable Crot Pro. 5.5. 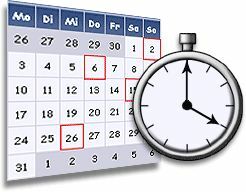 Save settings and wait for the cron scheduler to process the assignments submit the files for the checkup and receive results. Please note that processing may take significant time. When you run cron first time it sends the files for the checkup. When you run cron second time it checks with Crop Pro server if the results are ready. Please allow up to the 24 hours for the Crot Pro BETA to deliver you the results. 5.6. 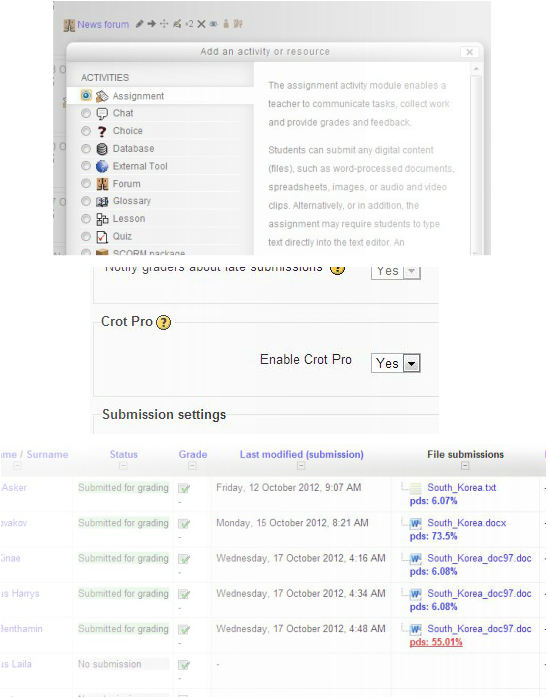 Go to the assignment, click "View submitted assignments" link and you will see the maximum similarity score for submitted files. 5.7. Open the link with similarity score and compare documents.